CLAWS were sharpened and coats brushed down as guinea pigs, rabbits, dogs and cats strutted their stuff in a pet show on Saturday at Gospel Oak Methodist Church, in Agincourt Road. Animals were entered into three categories: dogs, cats and small animals, where they competed for prizes including behavioural lessons and pet food. 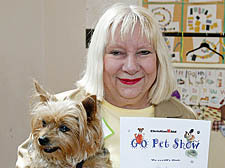 Local children paraded their precious pets in front of Claire Carpenter and Con Callaghan, from Fleet Road pet shop, Animal Crackers, who judged the competition. The event was organised to raise money for Christian Aid.